For many Americans, feta is their first foray into unfamiliar international cheese territory, beyond the cheddars, mozzarellas and American cheeses of their youth. Whether whole or crumbled, plastic wrapped or in a tub, feta cheese is a tart, salty and super tasty fresh cheese. On the Balkan Peninsula, where feta was born, and in Greece in particular, feta is made from either sheep or goat milk, because the hilly terrain there is where those animals thrive. In Wisconsin, we use cow’s milk for our feta, so it’s a touch less assertive, tart or gamy and a bit lighter. It’s also a whole heck of a lot fresher, since it doesn’t have to cross the Atlantic from Greece. 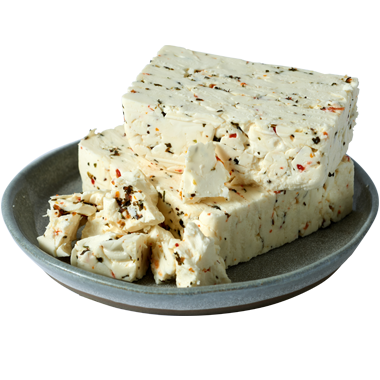 When submerged in brine, feta cheese can keep for weeks. If it is not, however, it will die a quick, moisture-starved death. To make a replacement brine, all you need to do is dissolve 3 tablespoons of salt per cup of water, and then submerge the feta in the cool or cold makeshift brine. If you’ve never had retsina, we highly recommend drinking this pine-flavored Greek white or rosé with feta. It’s like traveling to Greece without leaving your home. Any crisp and bright beer or wine will do for feta, but we particularly like pilsner, lager, pinot gris and grüner veltliner. It’s fantastic with ouzo too -- if you can handle the powerful anise, licorice-like flavor. Feta goes really well with olives, cured meats, dried and pickled fish, heirloom tomatoes and all sorts of other veggies, so we love it on a board or in any big salad, whether a Greek salad or not. Try baking or broiling it with olive oil and honey. Serve it with warmed pita, crack open a chilled rosé and clear your calendar.